Rob Oliphant: MP, tech trailblazer? This is the first time I’ve spotted a QR code on an election sign, right down there in the bottom right corner. 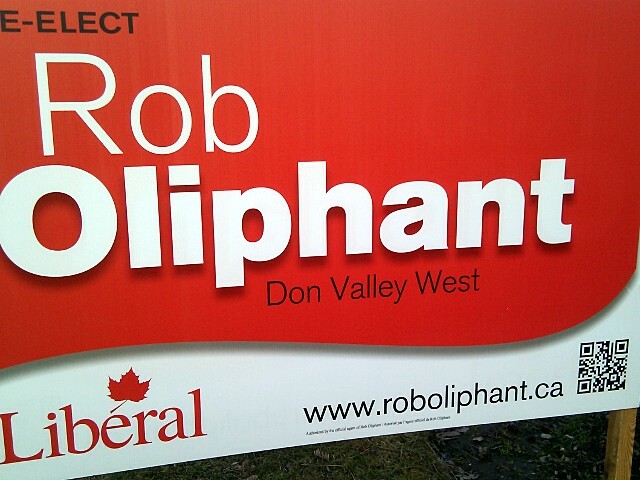 Rob Oliphant, Liberal candidate for Don Valley West, has them on all of his signs, though I haven’t seen them on the signs for other Liberal candidates. Are any other candidates around the city using QR codes? I was hoping that this one would be a direct link to Oliphant’s views on UBB, mobile competition, digital law, or something else that might be of particular interest to the kind of person who would use a QR code, but it just links to the main page of his web site. Still, kudos to him (or someone on his campaign team) for thinking to put the code on his signs.